VT Technology Blog: Management solution for Microsoft Hyper-V Server Core. Management solution for Microsoft Hyper-V Server Core. The Server Core is great for virtualization. It makes it easier for administrator to get the system configured and started. There are many benefits in using Server Core, including greater stability, reduced maintenance, reduced memory and disk requirements and reduced attack surface. With Server Core you can significantly minimize your expenses and have a smaller storage footprint than a comparable deployment of full version of Windows Server. Check out some benefits of deploying Windows Server Core Installation here. However, because there is no GUI, management of this installation demands a great deal of experience from user, involving the use of RSAT or Virtual Machine Manager. VMM is expensive and RSAT doesn't let the administrator to manage some versions of Hyper-V Server from the older OSes. These issues might prevent administrators from deploying Server Core on their servers, despite lower costs and other benefits. 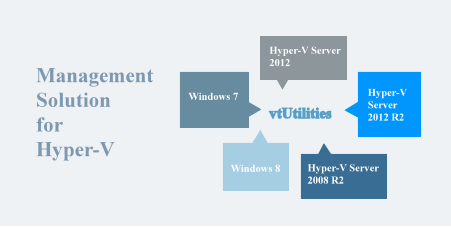 VT Technology Management Utilities for Hyper-V remove the need for RSAT and VMM. More importantly, there is no steep learning curve for using vtUtilities to manage Server Core. This step-by-step guide will help you with setting up your environment from the scratch and outline using vtUtilities on Server Core or free Hyper-V Server. vtUtilities can be installed locally on a Hyper-V host and deliver GUI with functionality level similar to Microsoft Hyper-V Manager. Local GUI to manage Hyper-V on Server Core and free Hyper-V Server. GUI for replication, live migrations, VHDX, virtual Fibre Channel adapters, file system views and operations. GUI for virtual network management including the management of virtual connections and bindings. Support for Windows Server 2008 R2, Windows Server 2012, Windows Server 2012 R2 as well as Hyper-V Server 2008 R2, Hyper-V Server 2012 and Hyper-V Server 2012 R2. Local and remote management of all past Hyper-V versions from a single application. Easy access to Hyper-V event logs and VM jobs history. Real time monitoring of Hyper-V host and guests.